The world is raving of integrated marketing for some time now. I thought, why not research its relevance to healthcare marketing. It did not take any time to figure out that healthcare marketing is incomplete without integrated marketing. What is integrated marketing? Well it is a concept which underlines a very practical aspect of marketing. It tells us that unless marketing is linked to all the operations of a business, it is incomplete. Picture this- You see a great article on a newly opened restaurant in the newspaper. Instantly you decide to take your family for dinner over the weekend to that restaurant. Next day, on your way to office, you also notice a beautiful hoarding with a catchy headline about the same restaurant. The whole week you are building up the excitement for yourself and your family. At the sub conscious level, you are sure that you will have a great time this weekend – because of the newly opened restaurant. Finally when the D-day arrives and you reach the place, you are greeted with a cold gatekeeper, who asks you to wait outside as the restaurant is closed for cleaning [operational error]. As if it is a mistake that you have made by coming in early. Finally when you enter, you find that since there is nobody that has been appointed for Chinese cooking in the new restaurant, your favourite Chinese Schezwan rice cannot be cooked[HR error]. So, you order something else. The place is hot as an oven because the A.C. will only be swithched on after the place fills up with people. You realise that it is not viable for the restaurant to run the air conditioning just for 3 guests [Financial Constraint]. Not only will you not visit that place ever again, you will also endanger your relationship with friends who talk good about that place. The point is- Marketing is useless, in fact it backfires if you are not integrating your financial, HR and operational performances to it. Marketing cannot function in isolation. In fact, if you look really deep, everything in an organisation is linked to marketing and vica-versa. So, its time for us, the ‘marketing’ thinkers, to start thinking about finance, operations, HR and other areas of running a hospital. Only after we ensure that we are ’ marketworthy,’ we should try to market ourselves. In this context waiting times, billing systems, attrition rates, overhead costs, down time of machines, etc. become very important for marketeers. 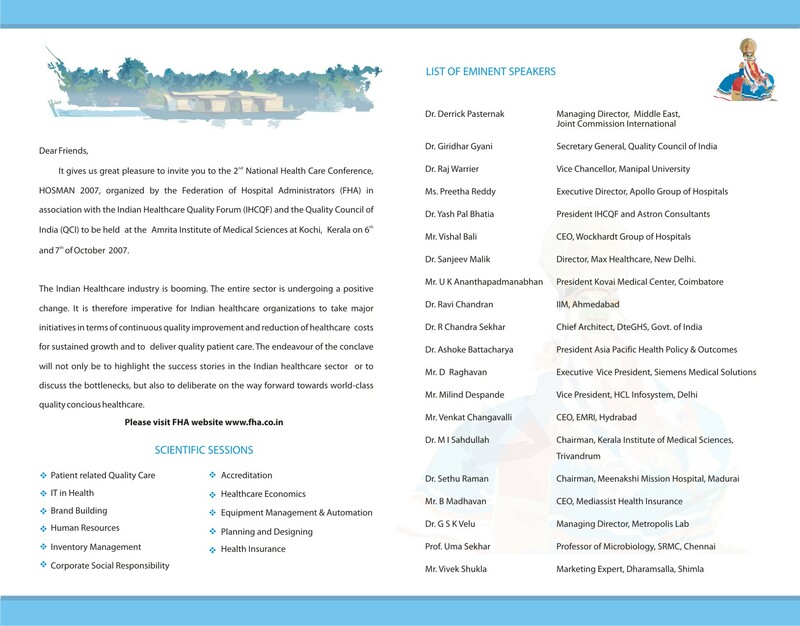 I am presenting the entire topic of Integrated Marketing Approach for Hospitals in a forthcoming, widely talked about conference. There are also a plethora of other industry experts in HOSMAN 2007 at Kochi on October 6 th and 7th. It is worth being there. You can write to [email protected] or [email protected] for more details.